Broccoli Bread is a fabulous cornbread recipe that’s moist and delicious and a great side dish to any kind of soup or main dish meal. There are only a handful of ingredients making it rather easy to make, too. It has a nice texture with a little sweetness from the corn muffin mix, a little crunch and texture from the broccoli and cottage cheese, and a light souffle-type texture making it succulent and delectable. I’ve had three people give me their version of this recipe and I looked at all three when I made this recipe the other day and adapted all three of them to fit our tastes. 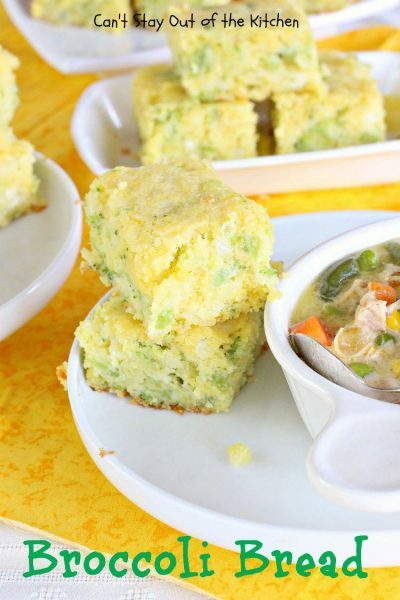 This is a mouthwatering melt-in-your mouth cornbread that’s great to serve for company as well as with any kind of soups, chowders, or other comfort food. 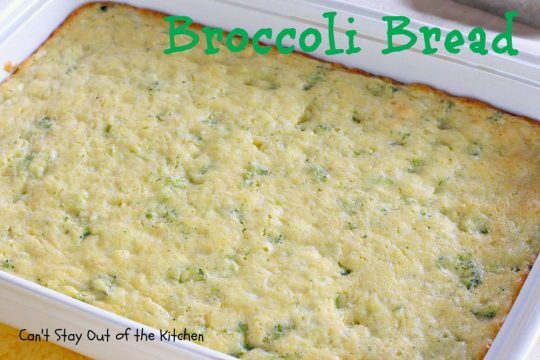 Quite frankly, I think Broccoli Bread is comfort food! I first made this recipe back in July of 2012 shortly after I began my blog. I didn’t have a good camera or take particularly good pictures back then. 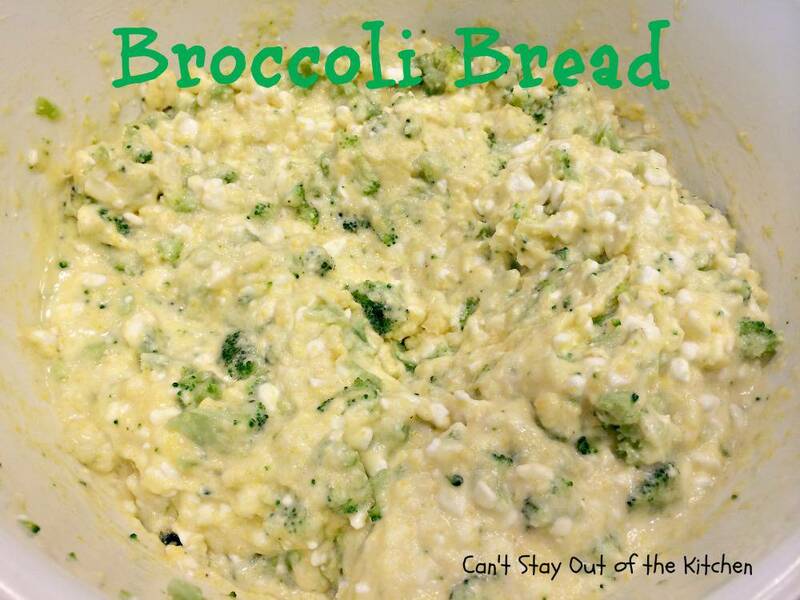 I recently made another batch of Broccoli Bread and freshened up the pictures. I made it as a side for a soup I was making for friends who recently had a new baby. 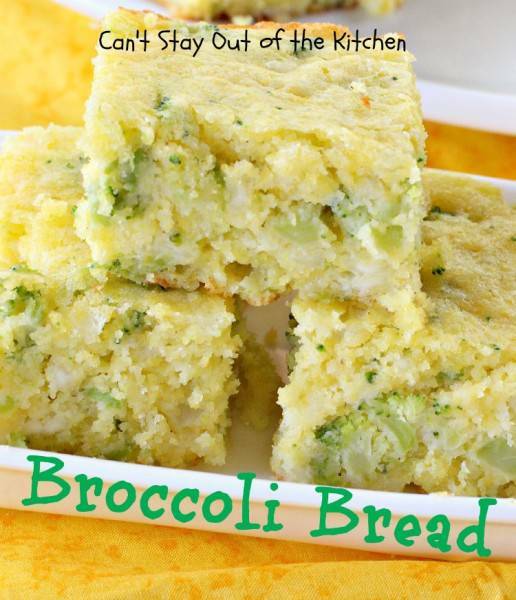 The nice thing about Broccoli Bread is it not only has a superior taste but transports very well, too. 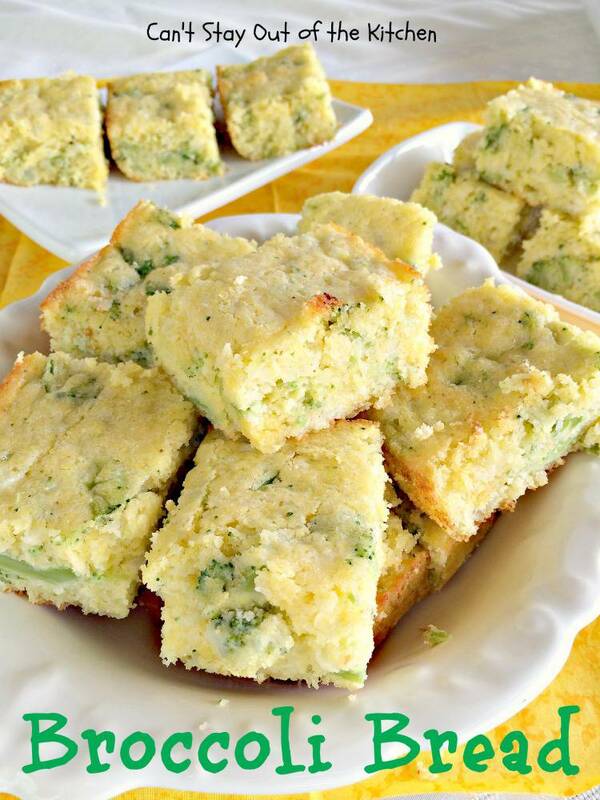 If you’re looking for a great tasting cornbread recipe, why not give Broccoli Bread a try? 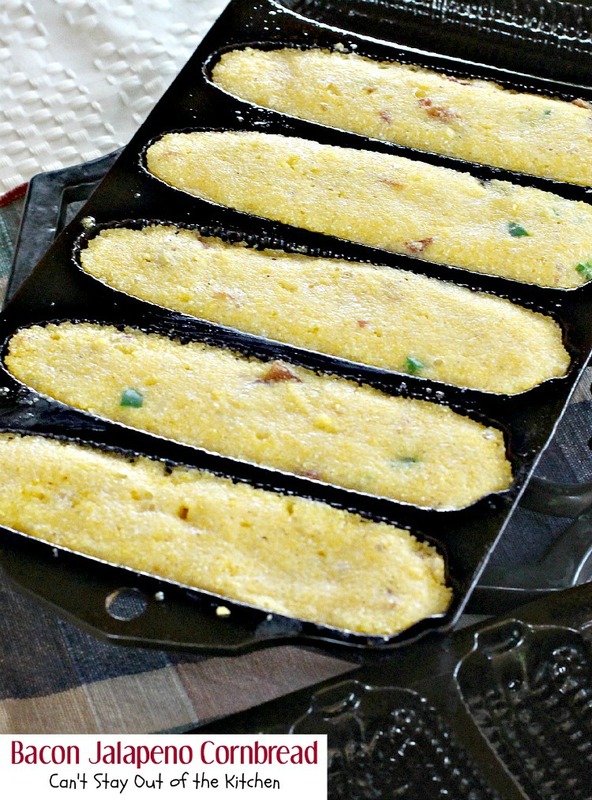 I’m sure you will love this scrumptious cornbread just as much as our family does. Plus, you will enjoy the added bonus of having a recipe that’s so quick to whip up that you have time to concentrate on other dishes. Enjoy. Broccoli Bread is a scrumptious cornbread you’re family is sure to love. This is so yummy! And, even better, it is quick and easy! Broccoli Bread is a great side dish for soups and stews. Melt the butter in a mixing bowl. 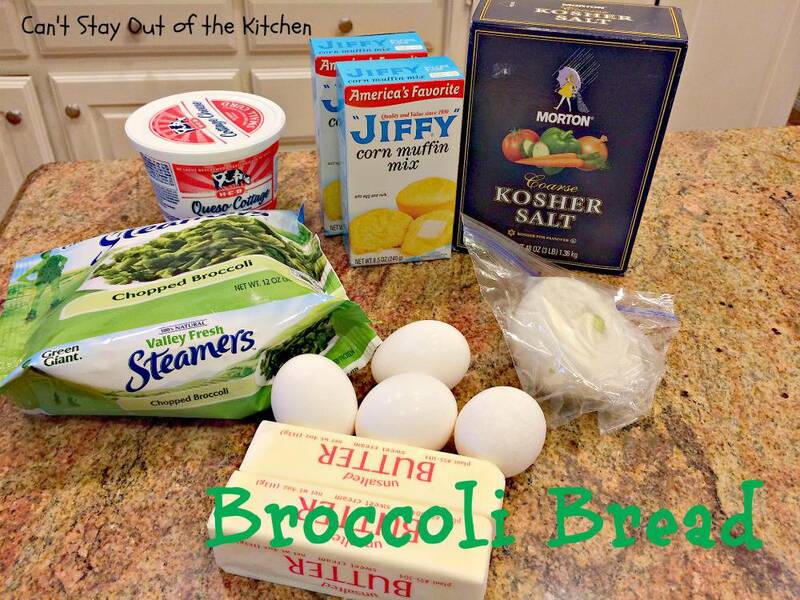 Add diced onion, eggs, cottage cheese, corn muffin mix and frozen, chopped broccoli. Pour it into a 9×13″ greased casserole dish and bake at 350 for about 45 minutes or until done. 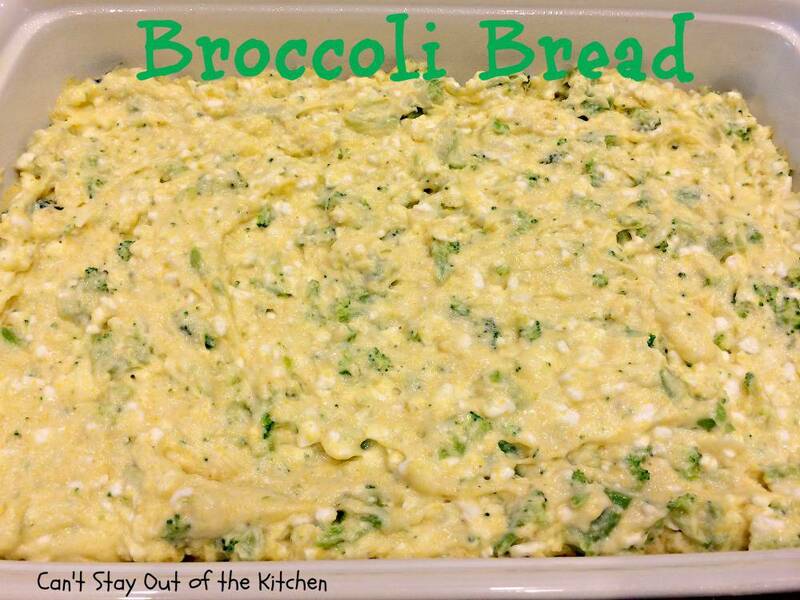 Here the Broccoli Bread is done. 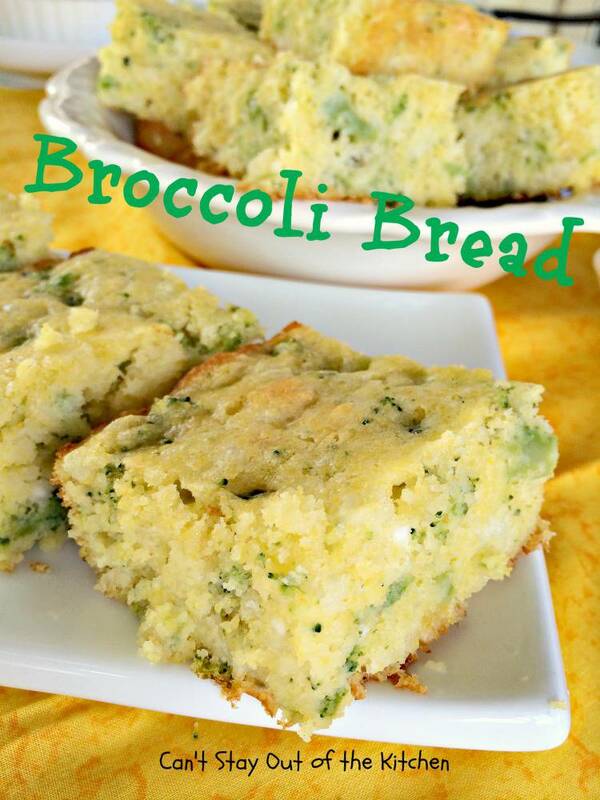 Broccoli Bread is moist, succulent and amazing to the taste buds. 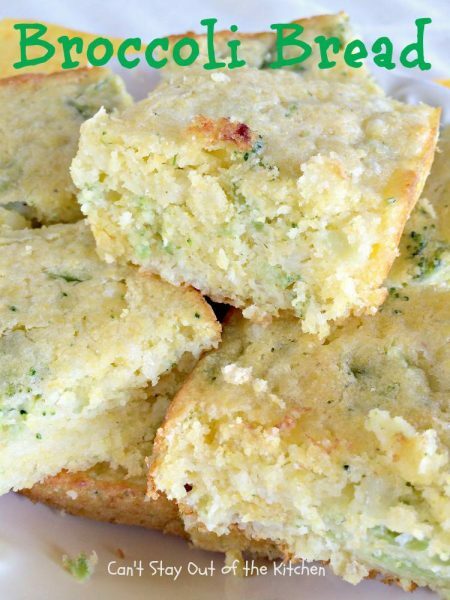 Broccoli and cottage cheese add a lot of texture and deliciousness to this cornbread. 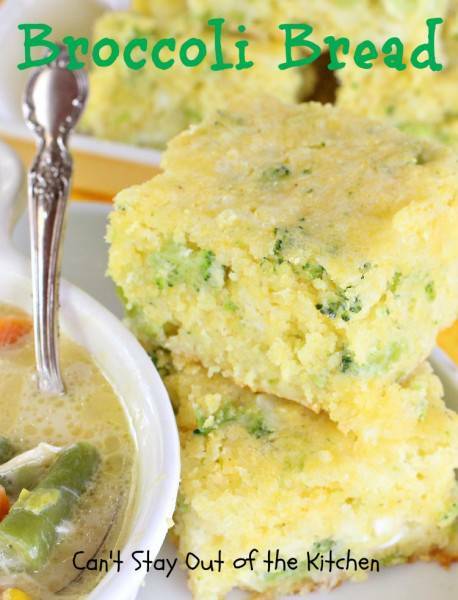 This lovely cornbread recipe features chopped broccoli and cottage cheese. Family favorite is great served with soup or chili or as a side for any holiday menu. Mix well with a wooden spoon and pour into greased pan (9X13”). Bake at 400°, 30-45 minutes or until lightly brown. NOTE: I was cooking a lot of things in the oven at one time and had a reduced temperature of 350°, so it took about 45 minutes or so to cook this completely. This is a wonderfully moist cornbread—not dry like most cornbreads. I was cooking a lot of things in the oven at one time and had a reduced temperature of 350°, so it took about 45 minutes or so to cook this completely. This is a wonderfully moist cornbread—not dry like most cornbreads. 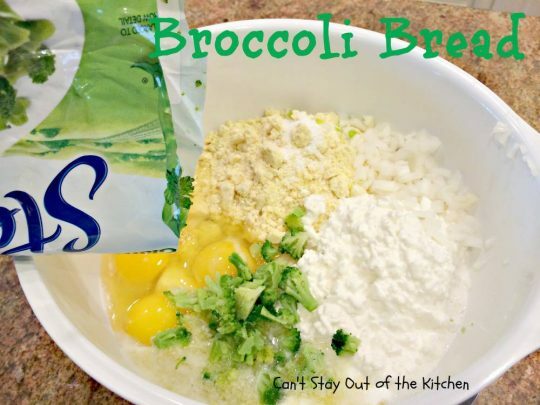 Broccoli Bread is so quick and easy to make. You can have this oven ready in about 5 minutes! This close up allows you to see the texture a little better. Absolutely, delicious! 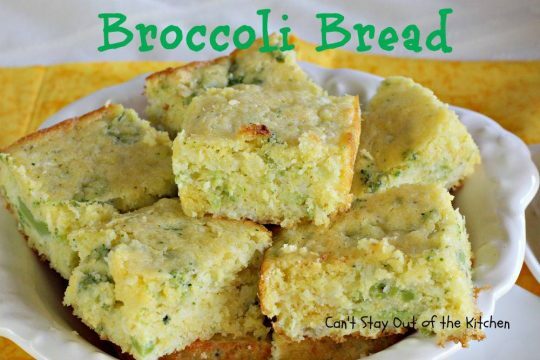 Doesn’t Broccoli Bread look delectable? Added a cup of shredded cheddar to this and it was absolutely delicious!! Thank you for the recipe!! can i make this in a loaf pan? Hi, Richard, I think you can but it may take a lot longer to bake. Insert a knife to the bottom of the pan. When it comes out clean then the bread is baked. It may take 45 minutes to an hour. Hope it turns out well, Richard. 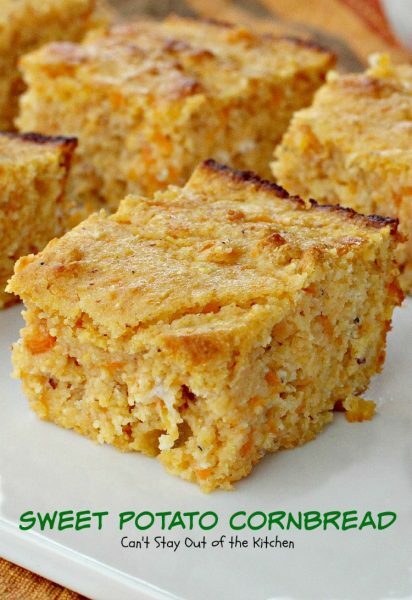 We love this delicious cornbread. 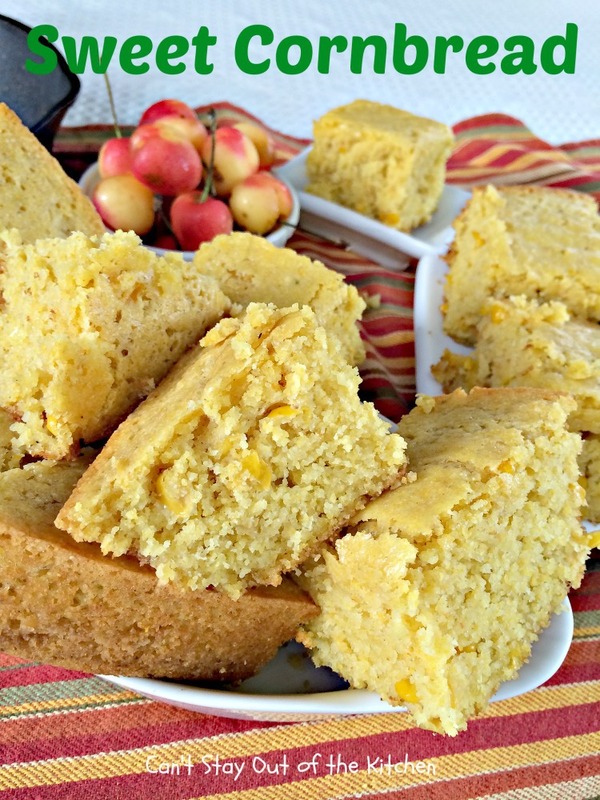 This is a wonderful corn bread. It almost tasted like a light, corn bread cake. It was super easy to make, and came out perfect. Thank you for the recipe! You’re welcome, Mary. I’m so glad you’ve been trying and enjoying lots of my recipes. This cornbread has always been a crowd pleaser whenever I make it.